Do want a hat that you can wear with semi-casual clothes for both work and play? Do you live in a warmer climate, or get hot too quickly in most hats? If you answered yes to one or more of these questions, then this hat is for you! 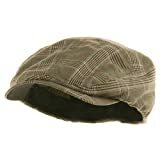 This is a 65% Poly/35% Rayon lightweight hat with a mesh liner and very breathable fabric. If your not familiar with this style of cap, it’s pretty much just a low profile baseball style cap with fabric going almost all the way to the end of the bill (but not to the very end, so it provides an easily finger hold for putting on and taking off the hat). This color works well with all shades of tans, browns and even greens. If you order this hat, you might want to brush up on your British Cockney accent, as I find it difficult not to speak like that when wearing this hat! (I’m sure that will pass in a few days). As a heavy guy who is heat sensitive and dresses in semi-casual tan business attire, this is the perfect hat for me! BTW: the vendor (currently E-Hats) shipped it very quickly via priority mail from CA and emailed shipping confirmation and tracking info… A+ for E-hats!. Love this hat. I have a pretty big head (7 3/4) so fitted hats aren’t always the easiest thing to find. The XL fits perfect, very comfortable, and looks pretty jazzy. Very happy.